There are a couple of items that I use on the daily that I’m constantly looking at and thinking “Wow, what did I ever do before this was in my life?”. 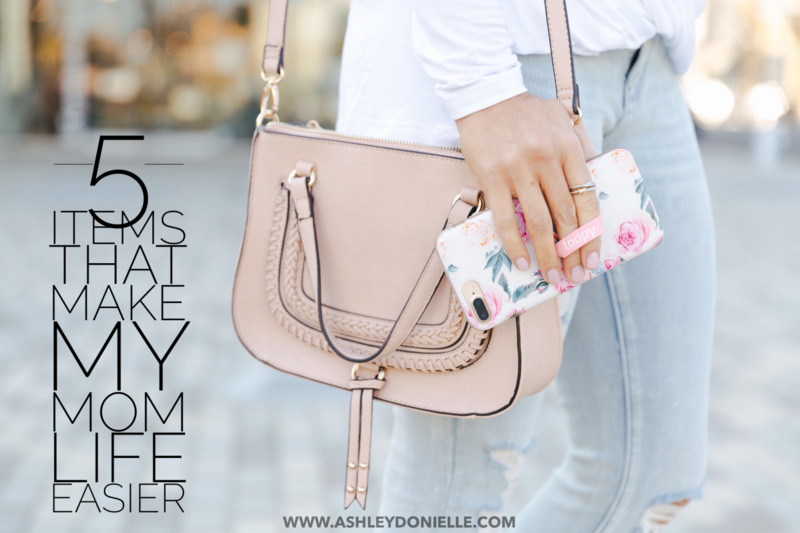 Especially now that I’m a mom, there are a couple of products/items that really make my day to day easier and let’s be real, when things are easier, we all are happy! These items are always popular questions and topics on my Instagram stories so I thought that I would create a post where all of the info is easily in one spot for all of you to find! Honestly, I don’t know how I ever lived without this phone case! I’ve had a pop socket for about a year and loved it but once I got the Loopycase, there was no going back! The loop on the back is adjustable and makes holding on to your phone SO easy! With the popsocket, you still had to hold it slightly between your fingers, with the loop you don’t have to apply any pressure at all. You can fully use both of your hands while carrying the phone on one of your fingers and it’s just a GAME CHANGER. The case is super easy to take on and off AND it totally protects your phone too. 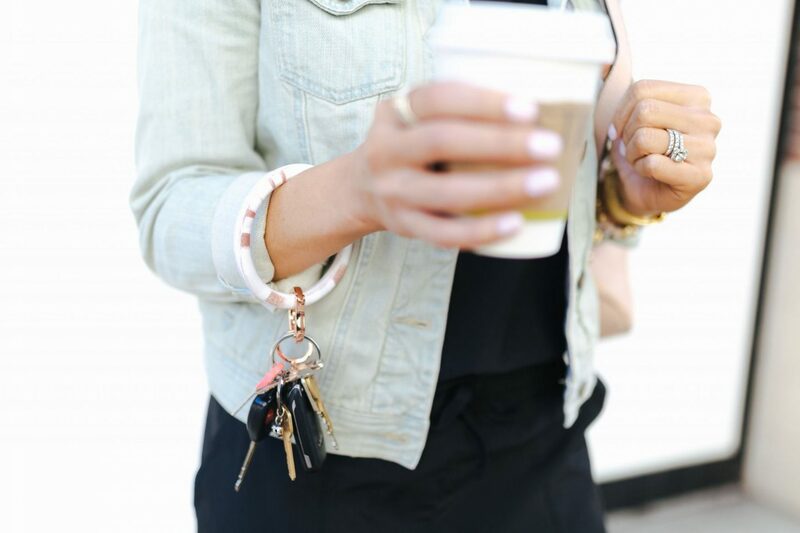 This key ring has changed my life…and that is not an exaggeration! It’s super easy to throw onto your wrist and carry without dropping anything! It also makes finding your keys SO EASY because the ring is the perfect size that it’s simple to spot and grab fast in your bag. You might be looking at this and thinking “I don’t need that”…..well try it. It will change your life too….promise! The infamous $20 vacuum is most definitely on my list! This thing is INCREDIBLE. I’ve owned so many vacuums and this one is hands down amazing for $20! It’s extremely lightweight, small, easy to store and ACTUALLY WORKS. As a mom, I’m always vacuuming…you feel me mamas?! So we have two of these (one upstairs and down) and it is so easy to just take out real fast, vacuum up a mess and put away. AMAZING! DUH! If you know me, you already knew that this mug was going to be in my top 5! Before this mug, I was reheating my coffee 2-3 times a morning. I can’t drink my coffee that fast and I like to do some work and sip on it. With the Yeti mug, it keeps my coffee warm for 3-4 hours and I usually always finish it in that time! I love the size (it doesn’t fit in a car cup holder by the way but I still take it with me in the car 🙂 and it fits two cups of coffee in it! If you want a lid that has a closure on it, this one fits perfectly (I ordered it separately). About 8 months ago, this pack ‘n’ play wouldn’t have made my top 5 list….now that Eloise won’t stop moving everywhere, it’s definitely a must have item that makes my mom life so much easier! I know that if I put her in the pack ‘n’ play, she will be contained, safe and totally ok if I need to do something that requires me taking my eyes off of her for more than a minute. (hey, mamas have to pee too!) We bought this under $50 one off Amazon and love it. It’s super easy to put up and take down and is pretty compact when you pack it away. If you are a mama to be, add this to your registry asap! What makes your mama life easier?! What else am I missing that’s a must have?! Because I went on a major shopping frenzyyyyy I have removed myself from social media for a little while. I just wanted to reach out and let you know —- by far one of my most missed IG bloggers I watched daily!! Seriously miss watching all your stories each day!